Moscow’s primacy in Central Asia remains unassailable. This year witnessed a thaw between the Russian Federation and Uzbekistan since the latter country’s leadership change in late 2016. With President Shavkat Mirziyoyev at the helm of the landlocked and isolationist state, work is now being done to rebuild the armed forces, who haven’t enjoyed the same material improvements as their neighbors. Last month, Russian media broke the news of a contract for a dozen “Mi-35 attack helicopters” that will be delivered as soon as 2018. These are the descendants of the iconic Mi-24 Hind that became a fixture during the Soviet Union’s long quagmire in Afghanistan from 1979 until 1989. News of the helicopter sale made the rounds online but not enough contextual details about it were provided. A public exhibition celebrating a quarter century of Moscow-Tashkent ties was the reported setting where the contract for Mi-35M was finalized between Rosoboronexport and the Uzbek defense ministry and its industrial commission. For the most populated Central Asian state (31.6 million people and counting) to embrace Russian exports isn’t surprising since these transactions were in the works for the past year. In December 2016 the defense minister’s of both countries signed agreements to enhance military cooperation, including joint training drills. Uzbekistan’s armed forces are equipped with late Soviet-era weaponry. Although token purchases of NATO kit were made in the past decade–the US even delivered surplus MRAPs in 2015–a stagnant defense budget meant little progress for a military often hyped as the region’s strongest. Uzbekistan’s air force, for example, appears quite formidable with its large fleet of MiG-29’s and Su-27’s but there’s little evidence vouching for its true effectiveness. Like so many ex-Soviet states and allies the Uzbek military possess a collection of Mi-24 gunships. If this newest acquisition is authentic it could be a sign the country’s combat rotorcraft are either unable to fly for lack of spare parts or derelict beyond repair. How much a dozen new Mi-35M‘s cost hasn’t been revealed, but in 2008 Brazil paid an estimated $300 million for 12. It can be assumed, based on the 2016 cooperation agreements its defense minister signed, Uzbekistan may have the benefit of a discount or a loan. The Mi-35M is an export variant of the Mi-24V and was first marketed globally in 1995. It’s recognizable for its bulbous step cockpit, non-retractable landing gear, and shortened wing stubs. Its weapons load out includes an oscillating twin barrel 23mm cannon beneath the cockpit and four hardpoints to carry anti-armor missiles and rockets. The Mi-35M’s credentials were further polished after it saw combat in Syria and Iraq from 2015 onward. Two VK-2500 turboshaft engines make it one of the fastest attack helicopters in the world with a top speed reaching 320 kilometers per hour. The Mi-35M retains one of the Hind’s key features–a troop compartment allowing it to ferry eight soldiers or serve as an ambulance. 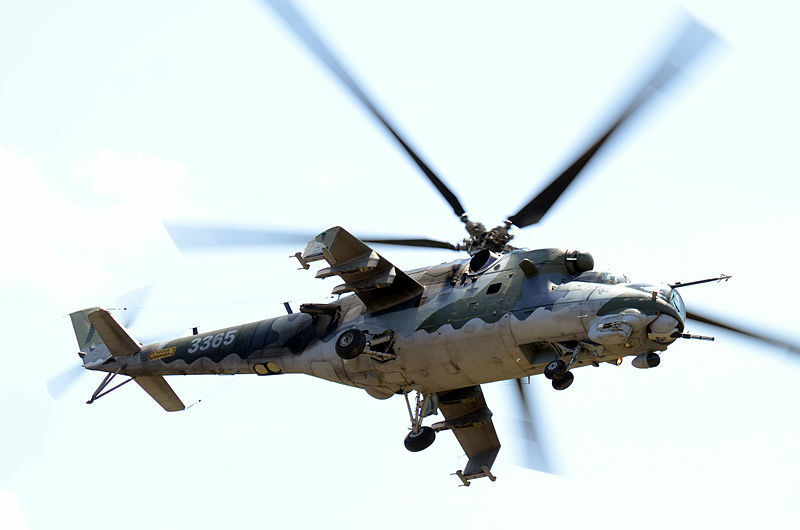 The Mi-35M also boasts new avionics and night time visibility for its pilots together with multiple countermeasures such as chaff and flares, infrared jamming, and an infrared suppressor on its engine. Since 2006 countries such as Azerbaijan, Brazil, Iraq, Mali, Nigeria, Pakistan, and Venezuela have ordered Mi-35M’s as close air support for both conventional and unconventional operations. Uzbekistan’s national security isn’t under grave threat at the moment. There’s still a serious risk of terrorist infiltration by citizens radicalized by ISIS in the Middle East. Picking up new attack helicopters looks like a serious attempt at reviving its armed might rather than upsetting its fellow -stans.